I departed back to India from Seattle. 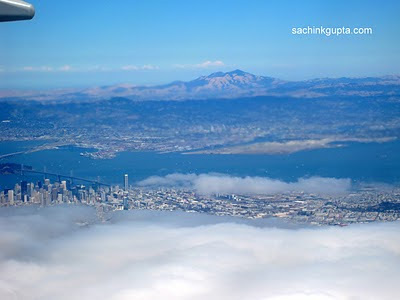 My first flight Seattle - San Francisco got delayed, and plan to quick visit to SF also vanished. I already exausted during this Seattle trip having just good time visit to Blake Island. But something better yet to come that day. Though It was too much cloudy and rainy. 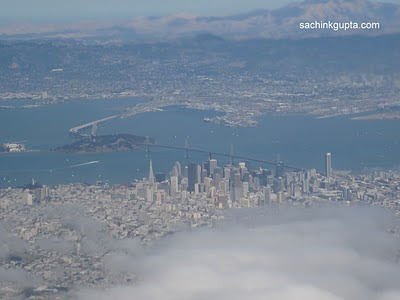 As soon as my next flight SF - Frankfurt take off, I take advantange getting window seat, and clicking some snaps. 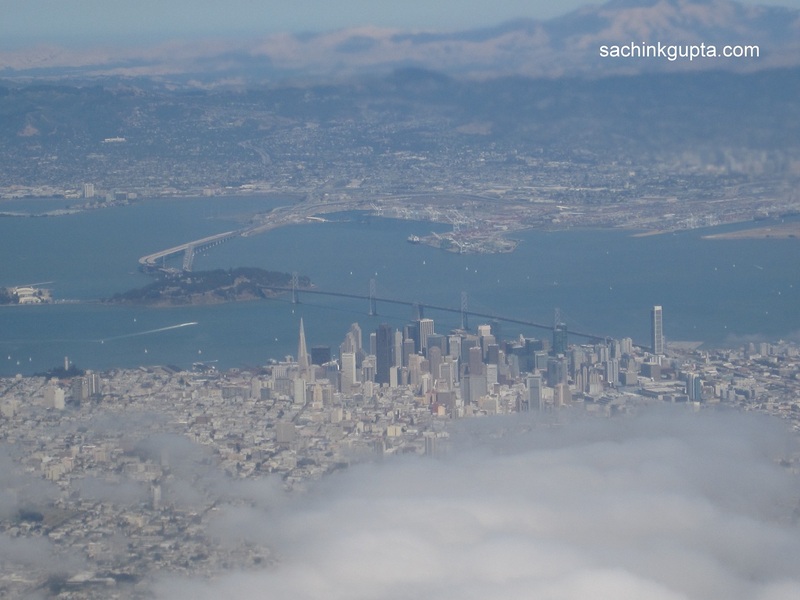 One snap of flight reflection over the clouds is good upto some extent and the snaps having the dense cloud blanket over the San Francisco city. As I go through some of the other SF websites and came to know that fog is the regular features of San Francisco summers. 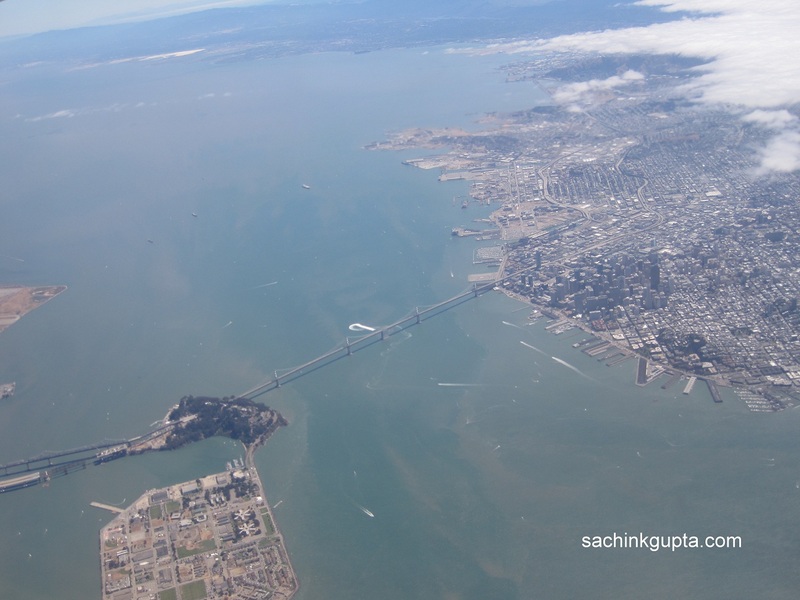 Sooner My eagle eyes got the glimpse of Golden Gate and SF - Oakland Bay Bridge. 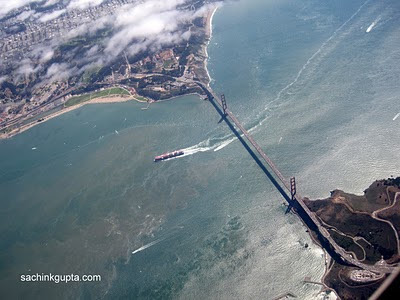 I have taken some of the videos over these bridges, and clicked some snaps in addition quickly. 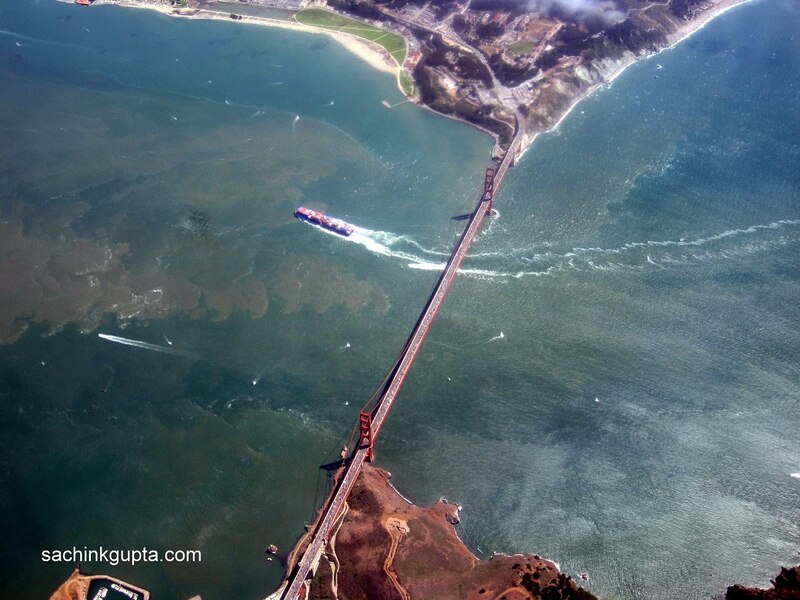 The timings of the luggage cruise crossing the Golden gate bridge add beauty to the sky view of Golden Gate bridge picture. After zooming I found that many boats were crawling at the same time, seems like the dots in the pictures. 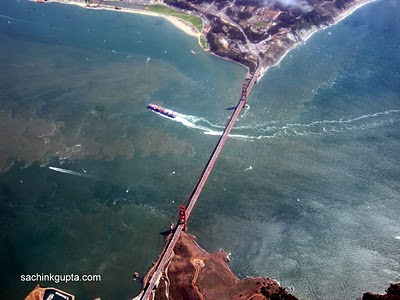 Another is the bay bridge (also known as "James 'Sunny Jim' Rolph" Bridge), has one of the longest spans in the world. It has 10 lanes (5 westbound on upper level, 5 eastbound on lower) for carriers. SF is also famous for its hills. There are more than 50 hiils within city limits. Some of those hills [Names unknown to me] can be enriched in these pictures. During the further flight, I also enjoyed cloud thunder and lighting. Most of the time the nature was playing hide and seek game with no cloud - dense cloud. I would say, This flight was like the helicopter tour of San Francisco city, Golden Gate, and Bay Bridge. It seems that I was rejuvenating the live google maps from the flight window. Now its time to relax, have snacks and small chat with beautiful air hostess serving :-) and way to India via Frankfurt. Yr photo is very nice . when u rreturn to home ? Thanks Prashant. I am absolutely fine. Now a days I am at Pune, and will meet you at home during Diwali.